The breakdown of these fibers is either due to an inherited defect, chronic inflammation, or glaucoma. The lens can fall either forward (anterior luxation) or backward (posterior luxation). 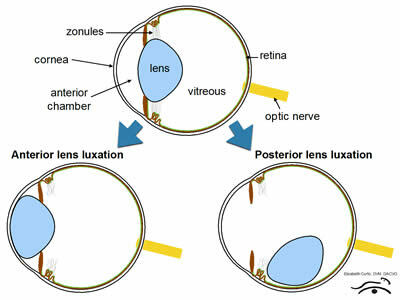 A subluxation means the zonules have started to break down and the lens is unstable but not completely out of place. When the lens falls forward, it will cause significant discomfort and is an emergency. When the lens falls backward, it is more benign and not uncomfortable for the animal. Common sequelae of lens luxation are glaucoma and retinal detachment. 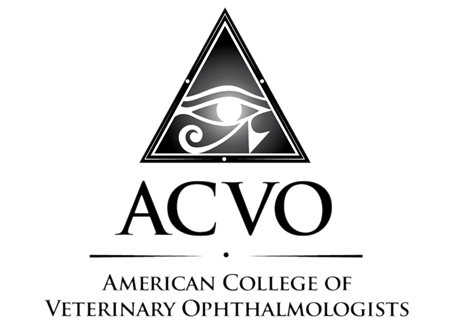 Vitreous degeneration is often seen in conjunction with lens instability and can be a benign change, but in certain dogs can mean that glaucoma and retinal detachment are more likely. In cats, zonule breakdown is usually secondary to chronic low-grade inflammation. In dogs, inherited zonular defects are always bilateral but may not be symmetrical, so while both eyes are always affected, they may not become a problem at the same time. Without surgery, most luxated lenses will become cataractous and cause chronic inflammation, corneal swelling and painful elevations in intraocular pressure. Removal of the lens is recommended for all types of lens luxation if there is a potential to recover vision. This procedure results in 30% loss of the focusing power of the eye but most animals function well after a short adjustment period. Distance vision is much better than near vision. Surgery is the only way to recover vision but even with surgery, retinal detachment and glaucoma can occur in the months or years after the procedure. Surgical lens removal is an option in eyes with light perception. Occasionally, the lens can be replaced behind the iris manually to avoid surgery (“couching”), which is a good option in dogs that are not good anesthetic candidates. However it is possible for the lens to re-luxate anteriorly requiring another procedure. The treatment decision should be weighed against certain absolute blindness and the increased potential need for enucleation (eye removal) in painful eyes. Laser retinopexy may be recommended in the perioperative period to decrease the risk of retinal detachment. Retinal detachment is not painful but often results in complete vision loss and is not easily repaired. Late onset complications of retinal detachment include glaucoma, which is painful.